Blend that is bursting with flavour! 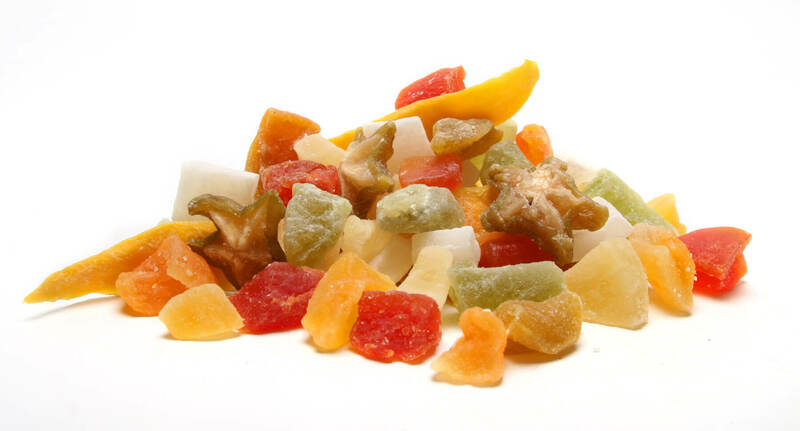 Mixture of dried Papaya, Pineapple, Cantaloupe (Rock Melon), Coconut Chunks, Peach Chunks, Star Fruit, Mango and Melon. Papaya (Papaya, Sugar, Lime Juice, Preservative (Sulphur Dioxide)), Pineapple (Pineapple, Sugar, Food Acid (330), Preservative (Sulphur Dioxide)), Cantaloupe (Cantaloupe, Sugar, Food Acid (330), Preservative (Sulphur Dioxide), Flavour), Coconut (Coconut, Sugar, Preservative (Sulphur Dioxide)), Peach (Peach, Sugar, Food Acid (330), Preservative (Sulphur Dioxide), Flavour), Starfruit (Starfruit, Sugar, Food Acid (330), Preservative (Sulphur Dioxide)), Mango (Mango, Sugar, Preservative (223 (contains Sulphites))), Melon (Melon, Sugar, Food Acid (330), Preservative (Sulphur Dioxide), Flavour).